I've owned the Great Escape Club from Pat Simmons of MasterGrip for over 15 years. I'm a Lefty Golfer and It's an awesome tool for hitting specialty shots from about 30 or less yards from the green/pin. It does really well in the sand shot and heavy rough areas around the green. I agree that the original grip was not very durable or long lasting, but I replaced it after a few years with a golf pride grip from GolfSmith and have had great success with it ever since. These are really hard to find now as the company only has sparse inventory on its website. I recommend looking online on websites like E-bay: https://www.ebay.com/sch/i.html?_from=R40&_nkw=pat+simmons+golf+clubs&_sacat=0&_pgn=1 They have a bunch up for sale between $15-25 per club. 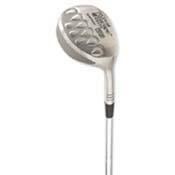 2ndswing.com https://www.mikesgolfoutlet.com/ https://www.carlsgolfland.com/and http://www.thomasgolf.com offers a somewhat similar product in loft ranges of 48 - 60 degrees. The only weakness of this Gap Wedge was the original grip, but I replaced that after a few years to a GolfPride Grip from GolfSmith and its truly a keeper. Don't let the weird shape/design fool you, especially the tear drops on the bottom of the clubface, as they are designed to help your swing through the sand and rough grass. Borrowed a friends and actually could hit out of the bunker with much greater ease. Where can I buy one of these? My club did not have the same type of sand in each bunker so i bought this club out of frustration. It is an incredible club for sand shots, flop shots, chip shots where you dont have much green. The grip is cheap and I replaced it. I don't care how it looks and my golf buddies don't like it because i can stick the ball close to the pin which costs them $$$. Swallow your pride ... the lower scores, more fun, less fear are all worth it! .... Oh... and the guy who thinks it "looks gay" ... I think they have classes for homophopia now. I'm not a scratch golfer. I've just picked up the game and I've taken lessons. In the past I've done pretty well in the sand and around the green. I just happened to acquire this club I didn't pay for it, but I recently played and used this club and it works wonderfully. I hit the ball in tough situations and the ball did exactly what I wanted it to do. The sucess made for a more enjoyable outing. My brother who I played with could not believe the many different shots I made with this same club. It has become one of my favorite clubs in my bag. Sorry "scratch golfer" successful and fun outing is the goal. I bought this club to replace by 60 degree sandwedge. GREAT CLUB for under 30 yards. The fellow that said this is "the gayest club" and people who use it should give up golf. What a crock, he is so far off base, who appointed him a golf club expert. I am a 16 handicapper and my biggest fear is getting out of sand. If this works GREAT!!!!!!. I don't have it yet but am eagerly waiting to try it out. If it will save 2 - 3 strokes it will be a bargain at $29.95! If not, heck it wil be one of the cheapest things I have tried of purchsed. First of all, this is the gayest club I have ever seen in my life. If you have to rely on a goofy club like this, you should quit the game of golf. Get lessons from your pro and learn how to hit a real golf club. A great club to get out of deep rough or when you need a consistent sand wedge. THE MOST easy club I've used to get out of sand. I also use it around green when I need a high, short shot with no room with which to work. Club has a pretty poor grip included on it which you may want to immediately replace. But overall a great value from Master Grip.